Tiny dimensions of an LED chip (0.35 × 0.35 mm), narrow-band emission spectrum, short response time and low thermal flux enables the creation of very compact multi-element LED arrays and LED matrices emitting at one or different wavelengths. The LED matrix is a kind of arrangement of similar or different LED-chips mounted in a single compact package and driven together or independently. 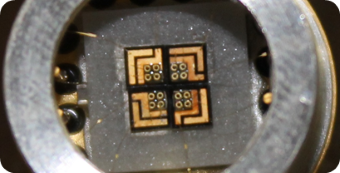 This kind of emitter is a powerful radiation source for portable optical analysing systems. ✔ Parallel connection of several LED chips that emit at the same wavelength and driving them together can provide a significant increase of total optical power. ✔ Connecting LED chips that emit at different wavelengths and driving them independently, or applying short current pulses sequentially to each chip, enables scanning of a certain spectral range with the help of a very compact radiation source. ✔ There is also a possibility to design a custom matrix combining different LED chips and choosing appropriate package.